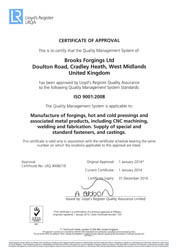 Brooks Forgings is proud to announce that it is the first company to be issued with ISO 9001, EN1090 and EN15048 by Lloyds Register. This is to comply with the Construction Products Regulation 305/2011. 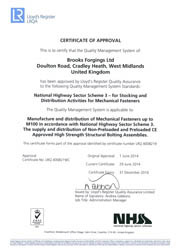 The combination of all three approvals means that our customers can purchase foundation bolting assemblies from one source with improved lead times and in full compliance with CE regulations.This gives us a greater scope of coverage than most other companies supplying the Construction and Civil Engineering sectors. 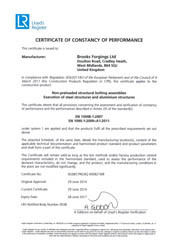 Compliance with EN1090-1 enables us to fabricate outer assemblies and the recent addition of EN15048 enables the hot forging and machining of non-preloaded structural foundation bolts. What is the Construction Products Regulation CPR 305/2011? The Construction Products Regulation (CPR 305/2011) applies to manufacturers, distributors and fabricators of construction products within the European economic area. To successfully comply with these regulations companies must undergo an assessment by a notified body such as Lloyd’s Register, and prove their systems and products are fully compliant with all aspects of these regulations. If the organisation is successful they are then awarded the CPR Certification. 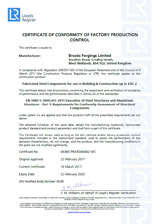 This enables them to mark their products with CE Marking indicating their processes and products are fully in compliance and can be marketed across the region without additional testing or barriers to trade.